This study attempts to compare two landscapes that have been engaged in the dismantling and recycling of ships: Chittagong, Bangladesh and Brownsville, Texas. These locations offer unique case studies within the industry, representing the shift from international to domestic disposal practices. In Chittagong, the facilities stretch for nearly 10 miles along the coastline of the Bay of Bengal. When a vessel arrives for disposal, it is first anchored in international waters before being beached during hide tide. Once stable on the long, flat, intertidal zone, thousands of laborers dismantle the vessels and transport the resulting material to nearby rolling mills for reconditioning. The recycled steel is then used for a number of purposes including regional infrastructure such as highways, bridges, and urban development. In the United States, many decommissioned vessels are “mothballed” in ghost fleets while awaiting disposal or reactivation. Once ready for disposal, many of these vessels make their way to Brownsville, Texas – 3 miles from the border of Mexico – to be dismantled. The ship breaking operations take place at the mouth of the Rio Grande Delta, home to a number of ecologically productive lagoons. Here, the ships are dismantled in slips located at the end of a 17-mile channel. “American Ship Breaking: It all Comes Apart at the Bottom of America”. in The Lay of the Land, Spring 2010. Los Angles: The Center for Land Use Interpretation, 2010. 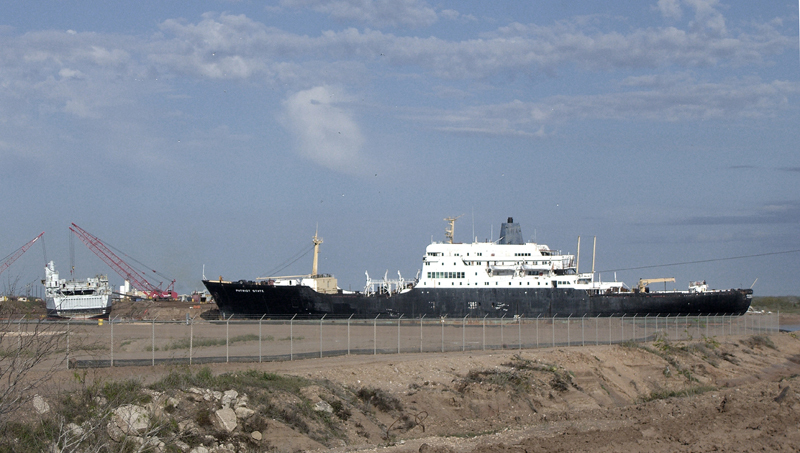 Ecological Restoration and Planning for Alang-Sosiya Ship-Breaking Yard. Volume 1: Integrated Report. Gujarat: Gujarat Ecology Society, 1998. “End of Life Ships: The Human Cost of Breaking Ships”. Paris: FIDH, 2005. Englund, Will. “Scrapping Ships, Sacrificing Men”. in The Baltimore Sun, December 7, 1997. Hess, R. Disposal Options for Ships. Santa Monica, RAND Corporation, 2001. Hossain, Maruf. “Shipbreaking Activities and its Impact on the Coastal Zone of Chittagong, Bangladesh: Towards Sustainable Management”. Chittagong: Institute of Marine Sciences, 2006. Rupa, Abdi. “Shipbreaking at Alang: Problems, Initiatives, and the Way Ahead”. Amsterdam: IIAS, 2009. Safety and Health in Shipbreaking: Guidelines for Asian Countries and Turkey. Geneva: International Labour Organization, 2004. Technical Guidelines for the Environmentally Sound Management of the Full and Partial Dismantlilng of Ships. UNEP, Basel Convention, 2002. “Workers in Shipbreaking Industries: A Baseline Survey of Chittagong, Bangladesh”. Chittagong: Young Power in Social Action, 2005.